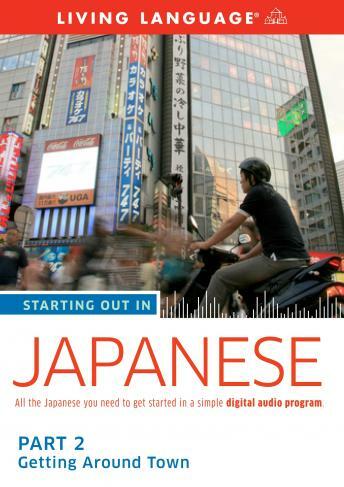 Listen to "Starting Out in Japanese: Part 2--Getting Around Town" on your iOS and Android device. Starting Out in Japanese, Part 2: Getting Around Town contains essential vocabulary, structure, and pronunciation in short lessons that are easy to master. In these lessons, you'll learn how to describe things, expressions for getting around town, and the vocabulary you'll need for dining out in restaurants. You'll also get the chance to practice what you've learned by listening to two everyday conversations. You'll be speaking Japanese right from the beginning, and you'll be surprised at how easy it is to learn. This course is a continuation of Starting Out in Japanese, Part 1: Meeting People and Basic Expressions. To take your learning even further, be sure to check out Starting Out in Japanese, Part 3: Working, Socializing, and Making Friends. You can also visit www.livinglanguage.com for a complete audioscript of this program.